Mathematical and scientific knowledge are integral to preparing our population to be actively engaged and responsible citizens. Science and mathematics education, however, has mainly focused on concepts and skills detached from societal implications. In this paper we present an interdisciplinary international design research study in which we developed teaching and professional development materials connecting mathematics and science education to citizenship education. We outline the design research process, its theoretical basis as well as the design products. The study shows that it is indeed possible to develop such approaches supporting active citizenship and thereby the development of 21st century skills in mathematics education, thus strengthening the role of mathematics education in the STEM field. The project MaSDiV received funding from the European Union Erasmus + Programme under grant agreement no. 582943-EPP-1-2016-2-DE-EPPKA3-PI-POLICY. This paper reflects only the authors’ views and the European Union is not liable for any use that may be made of the information contained herein. Burkhardt, H. (2018b). Towards research-based education. 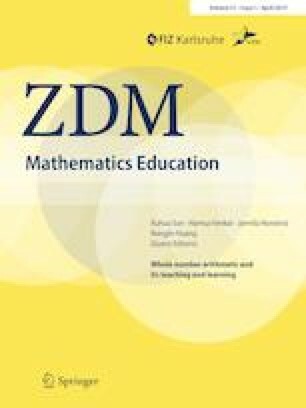 https://www.mathshell.com/papers/pdf/hb_2018_research_based_education.pdf. Accessed Jan 2019. Eurydice (2016). Promoting citizenship, common values of freedom, tolerance and non-discrimination through education. https://webgate.ec.europa.eu/fpfis/mwikis/eurydice/images/1/14/Leaflet_Paris_Declaration.pdf. Accessed 24 Mar 2016. Hazelkorn, E., Ryan, C., Beernaert, Y., Constantinou, C. P., Deca, L., Grangeat, M., Karikorpi, M., Lazoudis, A. Casulleras, R., & Welzel-Breuer, M. (2015). Science education for responsible citizenship. http://ec.europa.eu/research/swafs/pdf/pub_science_education/KI-NA-26-893-EN-N.pdf. Accessed Jan 2019.